The rent at Southgate Apartments ranges from $600 for a one bedroom to a $895 two bedroom. Apartments in this building are about 10% less expensive than the Southpointe average. This is a cat-friendly apartment. This apartment is in the Southpointe neighborhood in Fargo. Nearby parks include Brunsdale Park, Hampton Park and Madison Elementary Park. Southgate Apartments has a Walk Score of 48 out of 100. This location is a Car-Dependent neighborhood so most errands require a car. There is no shortage of variety within the Southgate Apartment Community. With four different properties, you're sure to find an apartment to fit your lifestyle. Whether you're looking for a cat friendly two bedroom with extra storage, or an affordable one bedroom with a garage - there's something for you at the Southgate Community in Fargo, ND. 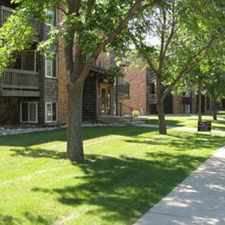 The Southgate Community is located throughout South Fargo, ND near 32nd Avenue and University Drive. Not far in any direction, there is a wide selection of shopping and dining options including grocery stores, take out, and dine-in. The green parks and recreational trails is another bonus to living in these great Fargo apartments. Explore how far you can travel by car, bus, bike and foot from Southgate Apartments. Southgate Apartments has minimal transit which means it is possible to get on a bus. View all Southpointe apartments on a map. Southgate Apartments is in the Southpointe neighborhood. Southpointe is the 17th most walkable neighborhood in Fargo with a neighborhood Walk Score of 44.